ACoRP has once again teamed up with Grow Wild, an outreach initiative of Kew Gardens, to provide wildflower seed kits to CRPs and station groups who are looking to add a bit of spring and summer colour to their stations. This year’s kits are a bit different, in that they’re focused on the size of the space groups have. The format is still similar to last year – kits still include wildflower seeds, a growing guide and resources for people to get their neighbours and group members involved in activity, and would work for both growing in containers. UK native wildflowers play an important role in our ecosystem. 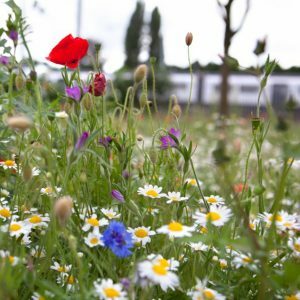 Large wildflower meadows are the best thing for supporting insects and animals, however it is clearly unrealistic to create these in urban areas. Some pollinators can’t travel too far to find food so it’s really important that there are food sources and refuges dotted around for them to visit. This is especially important in urban areas where the environment is often grey, with few sources of pollen and nectar. It really is a case of every little helps! Get your group growing wildflowers this Spring with Grow Wild! Applications close at the end of February and Grow Wild will let you know if your application is successful a few days later in time for the sowing season.